The Cleveland Browns highlighted 24 touchdown throws in a social-media video posted in honor of Baker Mayfield's 24th birthday. CLEVELAND — Baker Mayfield, the Cleveland Browns’ emotional leader and franchise quarterback, celebrated his 24th birthday Sunday, and the organization had a unique way of recognizing the special occasion. To celebrate Mayfield’s birthday, the Browns posted a video on their official Twitter page highlighting 24 of the quarterback’s NFL rookie-record 27 touchdowns during the 2018 regular season. No rookie in the near 100-year history of the NFL has thrown more touchdowns passes than Mayfield. Mayfield broke the NFL record with his 27th touchdown throw of the season with 3:24 remaining in the fourth quarter of a 26-24 loss to the Baltimore Ravens in an AFC North Division clash at M&T Bank Stadium in Baltimore on December 30. Mayfield averaged 281.75 yards and 2.375 touchdowns per game with Kitchens calling the plays. Individually, Mayfield set franchise records for the most passing touchdowns and yards by a rookie, and his 3,725 yards rank as the sixth-best single-season in team history, regardless of years of service. Additionally, Mayfield had three of the top five passing yards games by a rookie, as well as the fourth-most accurate season of any Browns quarterback ever. 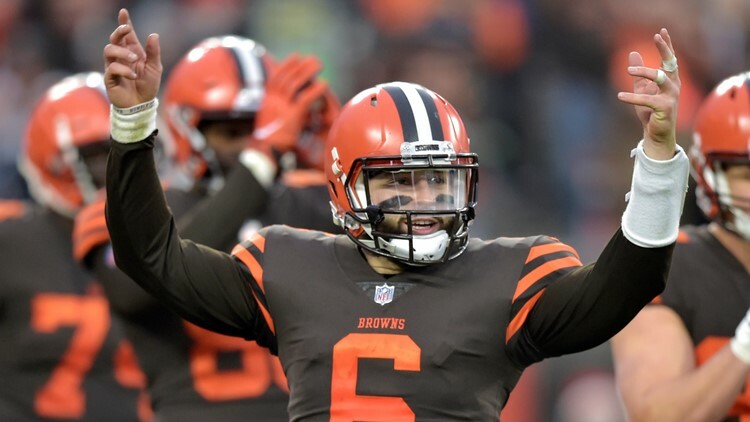 In addition to the PFWA honor, Mayfield won the fan vote for the Pepsi Rookie of the Week seven times, was the NFL’s Rookie of the Month for November and earned AFC Offensive Player of the Week honors after leading the Browns to their first season sweep of the Cincinnati Bengals since 2002. Mayfield and one of his Browns teammates, running back Nick Chubb, were finalists for one of the most prestigious honors for first-year players, as they were two of five athletes up for the Associated Press Rookie of the Year Award.